SALT LAKE CITY — When it comes to the happiest countries around the globe, the United States has slipped another notch on the list to No. 19, according to Gallup’s annual reckoning for the United Nations. Finland is the happiest place, while South Sudan is the least happy. But Americans are the glummest they’ve been since the report became an annual event in 2012. The World Happiness Report surveyed people in 156 countries and based its definition of happiness on per capita GDP, healthy life expectancy, personal freedom, social support, generosity and perceptions of corruption. The report was released Wednesday. The increasing challenge of addiction across America might be the reason the nation’s smile has slipped for the third year in a row, said one of the report’s authors, Jeffrey D. Sachs, director of the United Nations’ Sustainable Development Solutions Network. In this Saturday, July 29, 2017 file photo, Finland’s flag flies aboard the Finnish icebreaker MSV Nordica as it arrives into Nuuk, Greenland. Finland has come out on top of an international index that ranks nations by how happy they are as places to live. It’s not the only report to find gloomy news about America’s mental state. In January, another Gallup poll found that just one-fourth of Americans like the “direction things are going” in the United States, though 77 percent are satisfied with their overall quality of life. And more than 6 in 10 said they believe people can improve their situation by working hard. But just 26 percent were satisfied with such aspects of American society as morality and ethics. Meanwhile, the newly released 2018 General Social Survey found that young adult happiness is at a record low, with just one-fourth of young adults ages 18 to 34 saying they are “very happy.” And the Institute for Family Studies just republished an article on the declining state of mental health among America’s youths by Jean Twenge, a professor of psychology at San Diego State University who often writes about the negative impact of technology overuse on mental well-being. Lots of places are singing the blues, and most countries’ people are far less happy than Americans, despite the downward trend in the U.S. The report looks closely at “community” — both geographic communities and social networks — and looked at how happiness levels have changed over time, “with a focus on the technologies, social norms, conflicts and government policies that have driven those changes.” Various chapters also examine the effects of generosity and other prosocial behaviors, how one’s happiness influences voting and how internet use and addictions impact happiness, both good and bad. Technology isn’t the only suspected contributor to the glum findings. Some believe the increasing gap between the richest and poorest people in the world — and in America, as well — causes some dismay. “Prosperity may be rising by some measures, but it is far from evenly distributed,” said family therapist Ken Dolan-Del Vecchio, author of “Simple Habits of Exceptional (But Not Perfect) Parents.” People are working harder than ever, for longer hours, without sharing in the rewards of their productivity, he added. “The rewards are mostly going to the very rich. In fact, the vast majority of people have seen little growth in their pay and substantial decline in employment security during the past several decades. It can prove difficult to be happy when facing the stress of overwork and economic insecurity,” said Dolan-Del Vecchio. Happiness is more than a feel-good emotion. Experts claim it boosts overall health and well-being. Professor, psychologist and researcher Edward F. Diener, one of the world’s most recognized happiness experts — he wrote the book “Happiness” — said happiness might even extend life when the Deseret News interviewed him in 2017. Carol, left, and Ed Diener discussing where Ed has collected data on happy families from around the globe in Salt Lake City, Utah on Monday, Aug. 28, 2017. Ed Diener is a research psychologist and Carol is clinical psychologist and they have applied principles of happiness and wellbeing to their family life and their lives together. Diener and other happiness researchers also point out that giving one’s time and resources to help others can boost happiness. According to the new World Happiness Report, nearly two-thirds of American adults reported donating to charity within the past month, while more than 4 in 10 volunteered their time and effort. What else can people do to increase their personal happiness? Diener, too, noted the importance of “supportive social relationships,” something he said all genuinely happy people have. Also on Diener’s list was finding meaning and purpose, caring about others and getting out of poverty. And he noted that mental illness “devastates happiness,” so people who struggle with that should make getting help a priority. The silence that surrounds mental health issues is often the result of shame and fear. This is particularly true in the workplace, where many worry they will suffer professional consequences if their co-workers and supervisors learn of their behavioral health challenges. Sometimes, however, people keep silent about behavioral health issues simply because there is no space for such conversations in their workplace. If there is no precedent for initiating these sorts of conversations and people are not invited to share information about behavioral health matters, they likely will not feel comfortable discussing them. And so they remain silent, unsure of how—or where—to raise the topic. At Prudential, we have worked to create an environment where people can talk openly about their behavioral health issues without fear of reprisal or recrimination. By establishing and promoting policies that acknowledge mental health needs—and more specifically, policies related to discrimination, harassment, and the Americans with Disabilities Act—we laid the ground work. But fostering a workplace where employees truly feel safe mentioning their behavioral health problems and seeking appropriate assistance and accommodations requires something more. The “something more” that we’ve added: an ongoing campaign of communications, webinars, and large-scale events that highlight the prevalence of mental health conditions, the importance of talking about mental health conditions in the same way you would physical illnesses, resources that are available, and the important role supervisors play in creating welcoming and helpful environments for all employees. Included in this campaign is a series of “Profiles in Courage” videos highlighting employees’ personal experiences with depression, addiction, and intimate partner violence. The individuals featured on these videos have also spoken about their personal experiences at company events attended and/or video-streamed by thousands of employees. In each case, the employee told their own story, including how their supervisor and the company’s resources helped. All of these efforts build awareness and a culture of support. They create openings for people with mental health conditions to voice their needs, be responded to with respect and kindness, and get referred to resources as needed. I am proud of the culture we’re building here, but admit it was not always this way. To get where we are today took a concerted commitment, the support of senior leadership, and the bravery of those first people who came forward to speak about their issues and need for help. Through a collective effort, we were able to shift our workplace culture to one that includes conversations about behavioral health. This sort of environment may seem unachievable in your own workplace, but culture is dynamic. There are actions any leader, manager, or individual employee can take to move the culture in a positive direction. Here are five ways you can help shift your workplace culture and create a space for open dialogue about behavioral health. To create a mental health-friendly workplace, you must have the support of organizational leaders. The best way to secure that support is to establish the connection between employees’ mental health and their performance and productivity. For example, depression is estimated to cause 200 million lost workdays each year. When leaders understand the connection between behavioral health and business success, they are more likely to encourage conversation about behavioral health. That is why when we discuss behavioral health policies and programs with leaders here at Prudential, we make sure they understand we’re not talking about health as though it occurs in a vacuum. We emphasize optimal health, including mental health, as a significant contributor to top performance. In your workplace, you may encounter leaders who view health as a purely private matter; one that has nothing to do with the workplace. These leaders may feel sympathetic to their employees’ behavioral health challenges, but also believe the workplace is not where employees’ stress, isolation, depression, health issues, or financial challenges should be mentioned or addressed. They inadvertently reinforce the stigma that quiets all mention of mental health conditions, thereby reinforcing the likelihood that employees with these conditions will shy away from using resources that could help. They miss a great opportunity for shaping culture and performance. People spend most of their waking hours at work and the work environment has an undeniably significant impact upon overall health. When leaders pay no attention to this, they lose the opportunity to promote optimal health and, with it, an opportunity to promote optimal performance. The idea that a workplace can have a neutral impact on health, or that health is irrelevant to the workplace, is an illusion. Every workplace is either adding to the health of its employees or challenging the health of its employees. It doesn’t make sense to leave this to chance. At Prudential, our health and wellness strategy is built upon a multi-dimensional view of health. Prudential Health and Wellness works to empower individuals to reach their greatest potential across five dimensions of health: physical, emotional, social, spiritual, and financial. 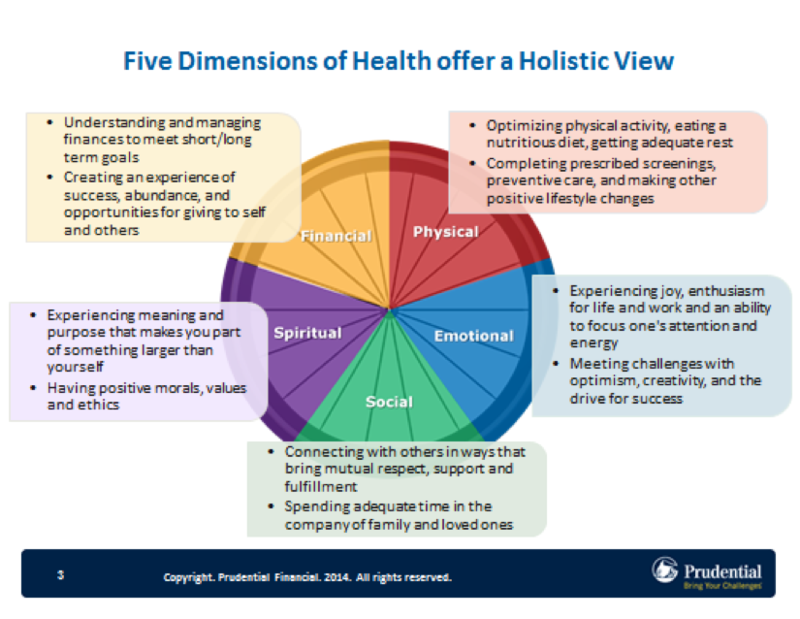 These five pillars help us to build more complete health and wellness programs and services that more adequately address the full spectrum of wellness. We emphasize this philosophy through ongoing messaging to employees at all organizational levels. The more our workforce hears that emotional health is part of the larger health pie, the more discussion of behavioral health becomes normalized and accepted. Here, we even go one step further, articulating that mental health is more than just one aspect of the health puzzle; it is a foundation piece that supports all five dimensions of health. That’s because optimal health results from our daily habits: what we choose to eat, how active we are, our compliance with recommended health screenings, how much rest we allow ourselves, our ability to emphasize pleasurable thoughts and feelings, the time we spend with our families and loved ones, the ways that we celebrate our connection to that which is greater than ourselves, and the ways we manage our money, for example. All of these “behaviors” together determine the extent to which we achieve our overall health potential. Mental health conditions can undermine all of the healthy habits mentioned above. Mental wellness, on the other hand, supports our ability to maintain these habits. Mental health, therefore, affects overall health in a significant way. As mentioned above, Prudential team members, including senior leaders, have shared their stories of depression, domestic violence, and addiction at major company events and via widely-viewed videos. They did so with the hope that others would recognize themselves in these stories and feel empowered to seek help. Their accounts were personal, powerful, and deeply appreciated. If there is an employee at your own workplace who is already open about mental health issues or their recovery from addiction, ask if they might consider addressing co-workers about the topic. And if there is not an in-house person able to stand up and share his or her story, invite a community member to do so. Just hearing these topics discussed in the work setting may prompt people suffering with similar issues to seek help. When we start discussing behavioral health openly and honestly, we pave the way for those who live with mental health conditions to feel as visible and welcome as those who live with diabetes, back pain, hypertension, and other health conditions. As Mr. Rogers used to say, “If it’s mentionable it’s manageable.” Let’s make mental health conditions mentionable at work so more of us can get connected to the resources that make mental health conditions manageable. Under what circumstances have or would you speak about mental health conditions at the workplace? What has been your reaction from co-workers when speaking about mental health conditions at the workplace? As a member of the Prudential Financial Inc. Health and Wellness’ leadership team, Ken Dolan-Del Vecchio is responsible for behavioral health and employee assistance program (EAP) services, implementation of Prudential’s work-life resource and referral services, and coordinating Prudential’s Incident Oversight Team. He provides consultation to managers, HR professionals, and work groups on issues related to leadership skills, interpersonal behavior, addictions, and violence prevention. Ken is a member of the American Family Therapy Academy, a national association for family therapy educators, clinicians, and researchers, a member of the boards of directors of The Multicultural Family Institute in Highland Park, New Jersey, and the Corporate Alliance to End Partner Violence. He is a past member of the board of directors of the New Jersey Association of Domestic Violence Professionals. Ken is the author of two nonfiction books, a family therapy textbook, and several articles/chapters in family therapy texts and journals.